Work-Integrated Learning (WIL) has taken four Electrical Engineering (Heavy Current) students at Central University of Technology, Free State (CUT) on an unexpected career path. They joined the South African Navy January 2012 and basic training took 3 months at the largest Navy training unit, SAS Saldanha Bay Lagoon. “Our students did so well that they were selected to continue training and do the Officers course” said Mr André Pawson, Lecturer in Electrical Engineering at CUT. Midshipman SP Sehloho, Midshipman TJ Moloi, Midshipman BM Mjezu, and Midshipman SD Mayekiso completed the dynamic Officers training in 9 months at Naval College in Gordons Bay. “We are currently stationed at SAS Wingfield, completing our practical module – P1 in Heavy Current at Armcore Dockyard” said Midshipman Moloi, “for the moment we are still land based, until we complete our National Diploma in Electrical Engineering (Heavy Current), after which we will be deployed onto warships, strike crafts, or submarines. This will be the end of our time together, but we look forward to the new experiences”. The group needs to complete their current practical, P1, and also P2, for their degrees to be conferred. Upon completion, the Midshipman will be ranked either Ensign or Sublieutenant, and they will be deployed as Naval Technical Officer (NTO) on board one of the before mentioned Navy crafts. The four Electrical Engineering students who are in the SA Navy, training and completing their National Diploma at CUT before they are deployed onto warships, strike crafts, or submarines. 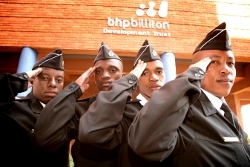 From left: Midshipman SD Mayekiso, Midshipman BM Mjezu, Midshipman SP Sehloho, and Midshipman TJ Moloi proudly saluting campus in front of the BHP Billiton Building, CUT’s Engineering hub.